The concept behind “Welcome! First Time in Korea?” a reality show that has been reaching record ratings on a cable channel, is relatively simple. The show features first-time visitors to Korea experiencing aspects of life here -- food, entertainment, history and culture -- and their reactions. The show last month starred a trio from Mexico, friends of Christian Burgos, a Mexican national who stars on the JTBC talk show “Non-Summit.” The friends brought fresh perspectives to everyday Korean pastimes – they ate pork belly barbecue and plucked stuffed animals out of claw machines with glee, and were at once delighted and horrorstruck eating raw octopus, a Korean delicacy. Friends of Daniel Lindemann, a German panelist on “Non-Summit,” took an analytical approach and toured historical sites. In the Sept. 14 episode, Lindemann’s friends from Germany toured the ancient Silla capital Gyeongju and stayed in a traditional Korean house, expressing surprise at the lack of chairs. The format lets Koreans rediscover small familiar things they wouldn’t otherwise give a second thought to -- such as ventilation fans above Korean barbecue tables, bidets in toilets. Lindemann’s friends delved into Korean history, visiting the Demilitarized Zone that separates South and North Korea, and Seodaemun Prison, where many Korean independence fighters were imprisoned and tortured during Japan’s occupation of the peninsula. They expressed grief and rage at Korea’s turbulent past. The guests then returned to Lindemann’s home and opened a bottle of traditional Korean liquor, describing its taste in detail. While many Korean reality shows travel outside Korea to show how people around the world live, the objective of “Welcome” is to show how exotic Korea can be to foreigners. “We don’t interfere in the friends’ travels, even if they got lost or confused,” said the show’s producer Moon Sang-don. “It’s interesting to see the unique perspectives through which they view Korea. “Welcome” is enjoying record ratings on the cable channel MBC every1, which had not seen a show pass the 2 percent viewership mark since its launch in 2003. “Welcome” surpassed that mark just after three episodes and on the Sept. 14 episode, hit 3.5 percent, according to Nielsen Korea, a ratings agency. 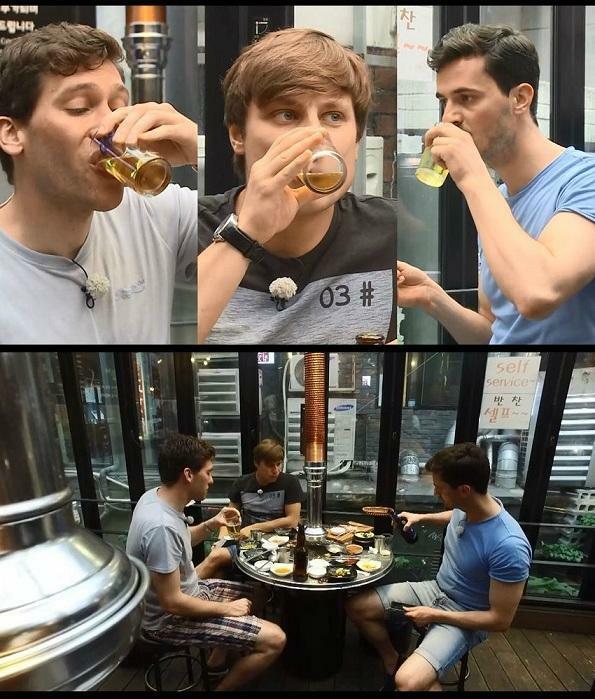 Culture critic Lee Moon-won notes the program’s similarity to the concept of YouTube channel “Korean Englishman.” The popular YouTube channel shows Britons Josh and Ollie experience Korean culture and lifestyle and introduce their take on it to Korean viewers. Both shows are tinged with a new type of nationalism, Lee says. If previously, Koreans had to strived to promote Korea, today, a more laid-back attitude has emerged, he says. 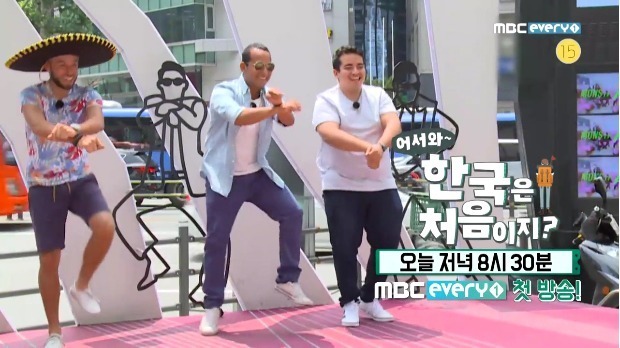 Variety programs featuring foreigners have become a staple in Korean television programming in the past decade or so. “Global Talk Show,” which ran from 2006 to 2010 and was sometimes known by other names such as “Chat With Beauties,” featured a panel of expat women discuss everyday life here in Korean. “Non-Summit,” which kicked off on JTBC in 2014, stars a group of expat men debate social issues, also in Korean. Australian comedian Sam Hammington is a regular television personality here, appearing on numerous shows, including “Real Men,” where celebrities experience firsthand military life in Korea. Viewers are delighted at their mastery of the Korean language and appreciate their sensitivity to subtle aspects of Korean culture. “Welcome” takes another spin on the presence of foreigners on Korean media. It reverts to “making Korea unfamiliar” to foreigners, according to culture critic Ha Jae-geun, inviting people who have never been here and documenting their novel experiences. In November, Olive TV will launch “Seoulmate,” pegged as a “global home-sharing reality show,” where foreign participants stay at Korean celebrities’ homes.